I have one of the most unique (and best fitting!) cloth diapers I have ever used to introduce to you today! The SoftBums Echo diaper uniquely adjusts for the best fit for your baby no matter what size your baby's waist or legs are! The SoftBums Echo is a 2-part system of waterproof Shells and removable Pods. 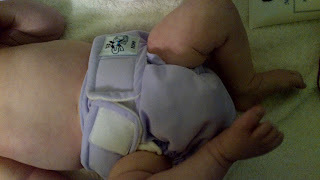 This allows incredible flexibility in how you configure your diaper! You can choose to use DryTouch Pods or Organic Bamboo Pods, both using the same great Echo Shell. Because the top layer is built into the Pod rather than the Shell (like a pocket diaper), you can usually reuse the Shell again. Switch back and forth between covers to let one air out in between changes to get the most out of them. Toss them in the wet bag, if they get soiled or really wet, and at the end of the day. This means you'll probably only go through 6-8 Shells a day for a newborn and 2-3 a day for babies over 12 months! But what is the best feature of all is the Slide²Size adjustment for the perfect fit for your baby! My daughter has been really tiny ever since she was born so it has been really hard to find a cloth diaper that would fit her! That is why I love my SoftBums diaper and its adjustable system! Echo Shells with Slide²Size are like no other! Unlike other one-size-fits-all diapers, the Echo uses no unsightly, complicated external snaps to size the Shell. The secret is the Slide²Size system, which adjusts the size of the diaper by letting you choose the size of leg openings, just like you'd work a drawstring bag and similar to high quality baby clothes and athletic gear. This diaper is so adjustable that it has no actual sizes at all! You can adjust the leg openings to be anywhere from 2" to 14". 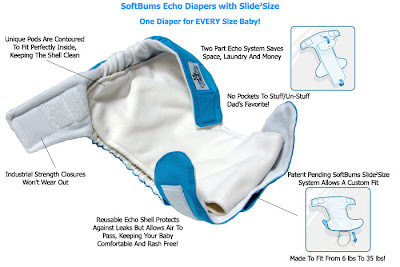 This means SoftBums Echo with Slide²Size really will fit a newborn, and really will fit a potty training toddler. Only SoftBums can guarantee to fit EVERY baby EVERY time!! 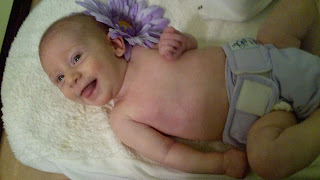 I received the special Lilac diaper of April because I love purple color on my daughter! I absolutely love the light purple color of this diaper, but best of all I love the fit! In addition to the great Slide²Size fit for the legs, it also fits my daughter's tiny wait too because it has overlapping waist tabs! The material on the inside of the diaper IS SO SOFT and so is the great DryTouch pods! 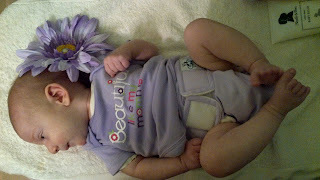 I love that this super soft material is against my daughter's sensitive skin and bottom! The Slide²Size system is secretly tucked into the inside of the diaper so it stays out of the way but is also easy to adjust when needed. Like, I mentioned, I really love the DryTouch Pods too! They are absorbent and economical. Use one for daytime and add a Mini Pod for older babies, nights and naps. 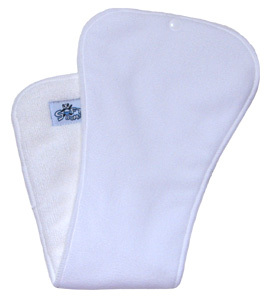 Made to fit just as easily in an Omni pocket and snapped into an Echo, these Pods contain 4 layers of absorbent microfiber and are topped with creamy soft microfleece. With no need to fold for larger babies, these are our easiest Pods yet. The DryTouch Mini Pods were perfect to use with my tiny daughter! They are composed of 3 layers of absorbent microfiber terry and topped with a super soft layer of microfleece to provide comfort and a dry feel for your baby! Lay them in your Echo Shell or stuff them in your Omni with a Pod to increase absorbency for heavy wetters or overnight use. You can put them on top or beneath the Pod. You can also use them alone with an Echo or Omni Shell for newborns for a super trim fit while still providing comfort and a dry feel along with plenty of absorbency for any newborn! So as you can see, this diaper is one of a kind, easy to adjust for every size child, and comes in great colors for every baby and personality! 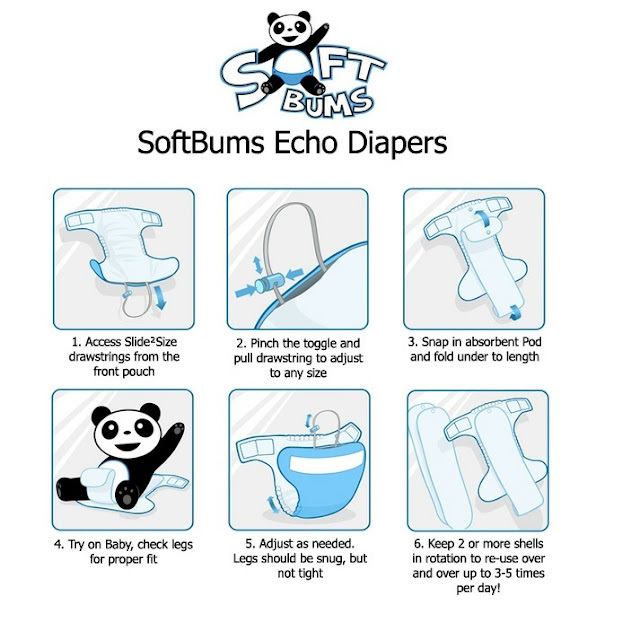 If you are having a hard time finding a good fitting diaper for your child, I highly recommend SoftBums Echo diapers! Buy It: You can purchase the Echo Shell for $21.95 and a DryTouch Pod for $4.95 on the SoftBums website. Win It: SoftBums is generously offering (1) Echo with a DryTouch Pod (you can choose color/print) to a lucky winner!